The Hugo Awards are given to the best science fiction or fantasy works of the previous year. Unfortunately, they've only been awarded since 1953. That still leaves decades of science fiction and fantasy works deserving of recognition but receiving none. That's where this column comes in. Awarded every year at the World Science Fiction Convention since its 11th annual meeting, the Hugos are the premiere award in the worlds of science fiction and fantasy. While the Retro-Hugos are covering the Worldcons in which no Hugos were awarded, there's still much to cover before that. Over the next several months, in open imitation of Jo Walton's splendid "Revisiting the Hugos" series at Tor.com, I'll be reviewing science fiction and fantasy works from 1885 to 1930 and deciding which novels and short works would have received the Hugo had a Worldcon been held that year and which novels and short works should have received the Hugo–often not the same thing. I'll read or reread as many of the works I'm addressing as possible. When I haven't read them, I'll say so. (Sometimes the work just isn't available). I'll be covering only novels and short works, as I lack the time to do a word count on the stories I'm covering and separate them into "novella," "novelette," and "short story." 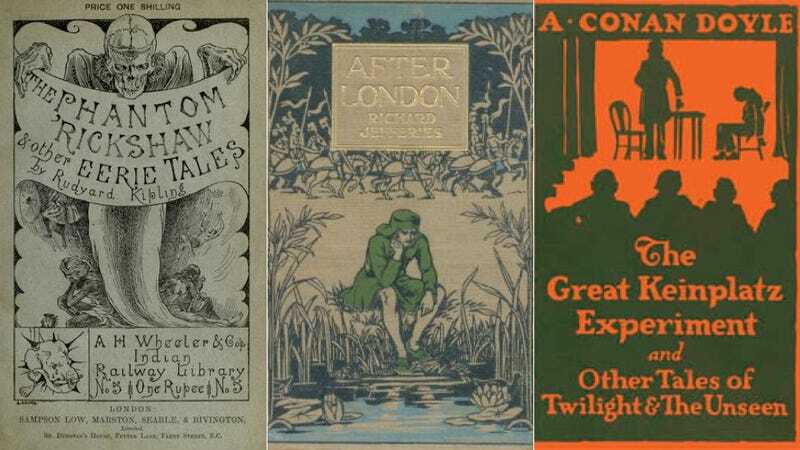 When appropriate, I'll include anthologies and short story collections in the novels category, as there were rarely enough anthologies and short story collections published from 1885 to 1930 to justify a separate category for them. I'll be limiting myself to English-language literature, on the grounds that voters for the Victorian Hugos would have limited themselves in that way. Like the Hugos, I'll consider serials for the year they finish, rather than the year they begin. And, of course, I'll be presenting my own biased and subjective views on each work. My opinion is just that, an opinion, albeit one backed by a large amount of reading in the field. Take it or leave it, but I do hope you'll consider reading at least some of the works I highlight. There's a huge amount of science fiction and fantasy that is undeservedly forgotten or known far less than it deserves, and if one person is inspired to search these stories and novels out based on what I write, I'll be happy. Why am I starting with 1885? Because it's the year before Jules Verne's Robur the Conqueror and Robert Louis Stevenson's The Strange Case of Dr. Jekyll and Mr. Hyde were published, which, to me at least, makes it an obvious starting place for modern science fiction. Looking at 1885 can give us a hint about what science fiction was like before it entered its modern phase. Of course, as far as science fiction is concerned, 1885 is not a particularly special year. Edwin Abbott's Flatland was published in 1884, Alexander Bettersworth's The Strange Ms. (an end-of-the-world-due-to-a-comet-strike novel) was published in 1883, Walter Besant's The Revolt of Man (a paean to male superiority disguised as a feminist utopia set in the 22nd century) was published in 1882, William Delisle Hay's Three Hundred Years Hence (a future history of the world) was published in 1881, and Edward Bellamy's Dr. Heidenhoff's Process (memory removal through neural degeneration) was published in 1880. Jules Verne had already had numerous works translated into English by 1885. The phrase "scientific romance" was already in regular use describing works of science fiction. In 1884 Charles Hinton's collection of essays and science fiction short stories inspired by Flatland even had the title Scientific Romances. Science fiction hadn't become a separate genre yet–putting genre literature into a ghetto was still two decades away–but writers, readers, and publishers were aware of science fiction as something distinct from ordinary mimetic fiction. So the novels and stories which appeared in 1885 wouldn't have come as revelations to readers, but instead would have been seen as new works in a growing genre. The Hugo short list for novels from 1885 would likely have consisted of F. Anstey's The Tinted Venus, Richard Jefferies' After London, Henry Morley's anthology Ideal Commonwealths, Rosa Praed's Affinities, and the English language version of Jules Verne's Mathias Sandorf. Matthias Sandorf would have taken the Hugo, but After London would have been the deserving winner. Anstey (real name Thomas Anstey Guthrie) isn't read much now, but in his time he was a major humorist. He was more popular with the British than with Americans, but his Vice Versa (1882) was a smash with both. Vice Versa is about a father and son who switch bodies and learn respect and affection for each other. It was the source of the films Freaky Friday and Vice Versa and every other parent-child body-switch story and film and is still in print today. Vice Versa made Anstey's reputation, and when The Tinted Venus was published it was billed as "by the author of Vice Versa." I thought Vice Versa was variously ham-handed, twee, and miserable–the hell of the Victorian English boarding school is driven home with force, but the humor is much less effective. I was not much more impressed with The Tinted Venus, a farce on contemporary society and Cockney life in which a man puts a ring on the finger of a statue of Aphrodite, which comes to life and pursues him romantically. Anstey isn't an unskilled writer, but humor ages very quickly, and what might have caused the audience of 1885 to laugh will likely not raise a smile today. Nor will Anstey's snobbery toward the lower classes sit well with modern readers. Nonetheless, Anstey's reputation and the humor of the book would have given The Tinted Venus (which is still in print, for what that's worth) the nomination. Jefferies has retained his reputation better than any writer here except Verne. He was a novelist and naturalist who was known in 1885 for his first two novels, Wood Magic (1881), an animal fable about a young boy who talks to the animals, and the non-fantastic Bevis (1882), about that boy's adventures as an older child. Both are worth seeking out: Wood Magic is full of concisely-drawn animals but does not fall into the traps of sentimentality or anthropomorphism, while Bevis lets Jefferies indulge his strengths, the depiction of pastoral scenes and childhood. Neither work would have prepared Jefferies' readers for After London, or Wild England. Jefferies was in very poor health when he wrote it. He died of tuberculosis just two years later, and his son died while Jefferies was writing After London. Jefferies' emotional state can be seen in After London, a post-apocalyptic novel in which Felix Aquila, the son of a Baron, travels around England 130 years after an unidentified something destroyed British civilization, reduced London to a polluted hellhole, and left the English at a feudal level. Jefferies' style is less stiff and dated than Anstey's, and his descriptions of the ecology and civilization of post-apocalyptic England are striking and memorable. After London was very successful and was the first major post-holocaust novel, a genre which would continue to be popular until Queen Victoria's death. Jefferies didn't invent the post-apocalyptic novel–the British had been reveling in them since the catastrophe novels of the 1830s and the Future War novels of the 1870s. But After London influenced other writers in ways that previous post-apocalyptic novelists had not. After London has aged only a little, has never gone out of print, and is deservedly seen as a classic. Popular enough to receive a nomination, it would have deserved the award itself. Henry Morley was famous in his lifetime as a scholar (at University College in London) and editor (the well-received series Morley's Universal Library and English Men of Letters). The 23rd volume of the Universal Library was Ideal Commonwealths, an anthology of utopias which included Plutarch's "Life of Lycurgus," More's Utopia, the first English-language translation of Tommaso Campanella's The City of the Sun, and Bishop Joseph Hall's Mundus Alter Idem. Morley's skills as a translator were not up to his other scholarly skills–his version of The City of the Sun is not just poor but is inaccurate. A full and accurate translation of Campanella, a historically-important utopia, would not appear until 1904, but Ideal Commonwealths was a popular success. More importantly, it was an academic success and became the standard anthology of utopias in both the U.K. and the U.S., a title it held for almost a century. It remains in print. Like many Victorian women writers, Rosa Praed was prolific, skilled, successful, popular, and forgotten much more quickly than her male counterparts. Praed made her name with romances and stories of her native Australia, but became much better known in the 1880s as a writer of occult fantasies. Affinities was her first novel of the fantastic. It's a roman a clef-society novel-occult horror about the threat posed to a young woman by a decadent poet and black magician (who is clearly meant to be Oscar Wilde). Praed has an easy, readable style that has aged only a little, and the proselytizing on behalf of Madame Blavatsky and Theosophy is much less obvious in Affinities than in Praed's later work. Affinities isn't as good as Praed's The Brother of the Shadow (1886), but nonetheless it's entertaining, found many fans, and is well deserving of the Hugo nomination it would have undoubtedly received. Verne needs no introduction. Mathias Sandorf is in some ways typical late-period Verne: full of adventure (Count Sandorf seeks Edmond Dantes-like vengeance on those who foiled his attempt to overthrow the Austro-Hungarian government), full of realistically-advanced technology (Sandorf's island fortress has electric boats, mines, and torpedoes, but nothing too fantastic or hard to credit), and dark (at its heart Mathias Sandorf is a revenge story in which murders are dressed up a justifiable homicides). Until recently Verne was badly served by translators, and the edition I read was the Victorian one rather than the (reportedly much better) 2005 translation. That said, I was unimpressed with Mathias Sandorf, despite Verne's attempts at writing an Dumas-like adventure story. Mathias Sandorf appeared during the 1877-1890 period when so much of Verne's work feels forced and uninspired, written because Verne wanted to write rather than because Verne had a novel he wanted to write. I think Verne's many fans would have given Mathias Sandorf the 1885 Hugo Award, but I think it's the weakest of the five finalists. Three other novels would have received votes: The Fall of the Great Republic (1886-88), Luis Senarens' Across the Continent on Wings; or, Frank Reade, Jr.'s Greatest Flight, and H.N. Crellin's Tales of the Caliph. The Fall of the Great Republic is an arm-flailing screech about the dangers of unrestricted immigration–the Irish take over the United States. British Hugo voters would likely barely have noticed it, but the more conservative of the American Hugo voters would have voted for it, more from sympathy with its ideology than from affection for its prose style. Similarly, the Edisonade Across the Continent dime novel is wretched as fiction and ethically disgusting, but it would have received votes from voters in search of morally vacant adventure fiction. Tales of the Caliph is a delightful Arabian Nights-style set of stories and stories-within-stories which I think is superior to all but After London, but Tales of the Caliph is humor, and humor novels rarely get the same consideration by award voters as more serious fiction. The Hugo short list for short works from 1885 would likely have consisted of W.H. Bishop's "One of the Thirty Pieces," Arthur Conan Doyle's "The Great Keinplatz Experiment," Rudyard Kipling's "The Phantom Rickshaw," Robert Duncan Milne's "A Family Skeleton," and Mrs. Oliphant's "The Open Door." The award would have gone to "The Open Door," though "The Phantom Rickshaw" would have been as deserving a choice. W.H. Bishop was a professor at Yale who wrote novels and short stories, but only two of his, the collection Choy Susan and Other Stories (in which "One of the Thirty Pieces" appeared) and the feminist utopia The Garden of Eden, U.S.A. (1895), had any fantastic content. Two of the stories in Choy Susan particularly stand out: the science fictional "Braxton's New Art," about a chemist trying to create pigments which will change color with the seasons, and the fantasy "One of the Thirty Pieces," a supernatural romance in which the pursuit of Judas' thirty pieces of silver leads to a tragic end for the seeker. E.F. Bleiler said, of "Braxton's New Art," that it is "literate, but one wonders at the point of it," while the romantic plot of "One of the Thirty Pieces" would have probably been more popular with the readers. "The Great Keinplatz Experiment" is one of Doyle's earliest stories, predating Sherlock Holmes' first appearance by two years. Reprinted in a number of American newspapers in 1885, its popularity had nothing to do with Doyle's name and everything to do with the humor of the story, which is about the mesmeric transference of personalities and the wacky shenanigans which result. I confess to finding it not particularly amusing. Its lumbering and unsubtle humor owes much more to mid-century Victorian tastes than to the sleeker wit of the 1890s. Like The Tinted Venus, "The Great Keinplatz Experiment" would have earned its nomination thanks to voters with more conservative and (for the time) traditional tastes in fiction. "The Phantom Rickshaw" was one of Kipling's first published short stories. He was only 20 in 1885, and as little known as Doyle. "The Phantom Rickshaw" is about an Anglo-Indian cad who mistreats a woman. She dies of a broken heart and then begins haunting him. The story has some flaws–the opening framing sequence belongs in a different story, something an older and more experienced writer would have known, and Kipling's narrative style underplays moments that deserved greater emphasis–but it is almost compulsively readable and has a few lovely moments of impressionistic near-insanity on the narrator's part. "The Phantom Rickshaw" has come to be seen as a classic–this, from a 20 year old–and would have garnered a number of votes. Robert Duncan Milne had some small reputation on America's West Coast in his lifetime, but in the 20th century he was virtually unknown until he was rediscovered by sf scholar and anthologist Sam Moskowitz. Thanks to Moskowitz's efforts, Milne is now seen as one of the most important American science fiction writers of the 19th century, and, as John Clute puts it, "one of the first genuinely extrapolative thinkers to work the field." But Milne's narration, though hardly amateurish, was rarely the match for his imagination, and "A Family Skeleton" is representative of this. It's the story of a child born with two brains and two faces on his head. He is raised in secret, but as an adult the two personalities quarrel with each other over a woman and strangle each other. Milne tells it straight where it would have benefitted from a more skewed approach, either Grand Guignol or (my preference) the sardonicism of Milne's San Francisco compatriot, W.C. Morrow. "A Family Skeleton" could have been a classic, but instead is merely a typical imaginative Milne story. Margaret Oliphant, pen name "Mrs. Oliphant, was perhaps the foremost professional female writer of England during the 19th century, writing over 100 novels and countless short stories and supporting an extended family through numerous personal tragedies (she outlived her husband and all seven of her children). "The Open Door," written after the death of one of her sons, is about the laying of the ghost of a young man who haunts a set of ruins, always calling out "Oh, mother, let me in!" "The Open Door," though told in the thicker and more traditional prose style of the 1860s, is among the best ghost stories of the 19th century. The ghost is sad, not malevolent, there is a level of sympathy and even compassion for the ghost usually missing from Victorian ghost stories, and the story is moving, not terrifying. "The Open Door" would receive the short form Hugo for 1885, and would deserve it. F. Anstey's The Tinted Venus. Bishop's "One of the Thirty Pieces"
Doyle's "The Great Keinplatz Experiment"